Let’s play for a moment. Imagine you are standing on the deck of a ship – a tall ship, one with tiers of large white sails, a huge ship’s wheel, and a long bowsprit reaching forward of the 60-odd metres of deck. You’re in the middle of the blue ocean, far from any visible land. A lone albatross drifts on the waves and then the wind begins to pick up, skimming across the water and rattling ropes and tackle. As you hear the loud call of ‘two!-six!-heave!’, rigging creaks, masts groan, the enormous expanses of sailcloth above you catch the wind, and the ship begins to pick up speed. What’s happening is a common marvel of one of the most delightful of sciences: physics. 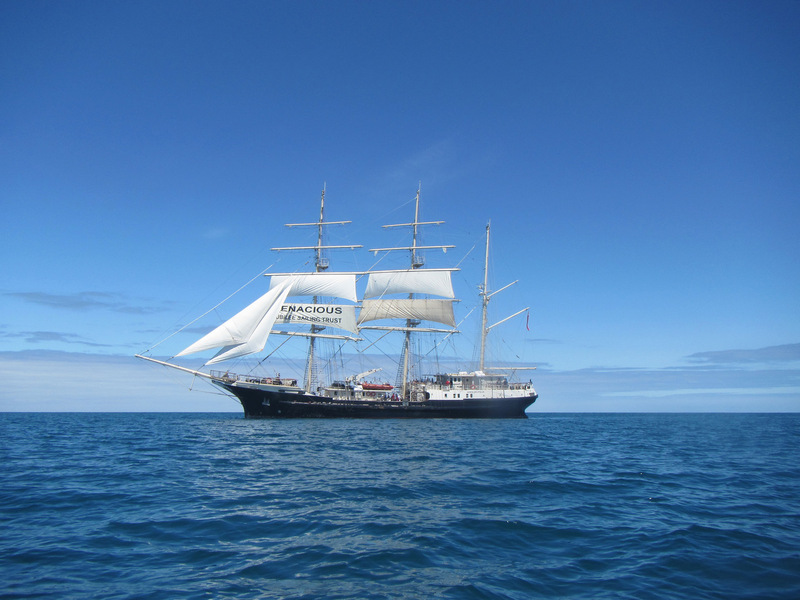 In December I had the chance to sail the tall ship SV Tenacious across the Tasman Sea to New Zealand. 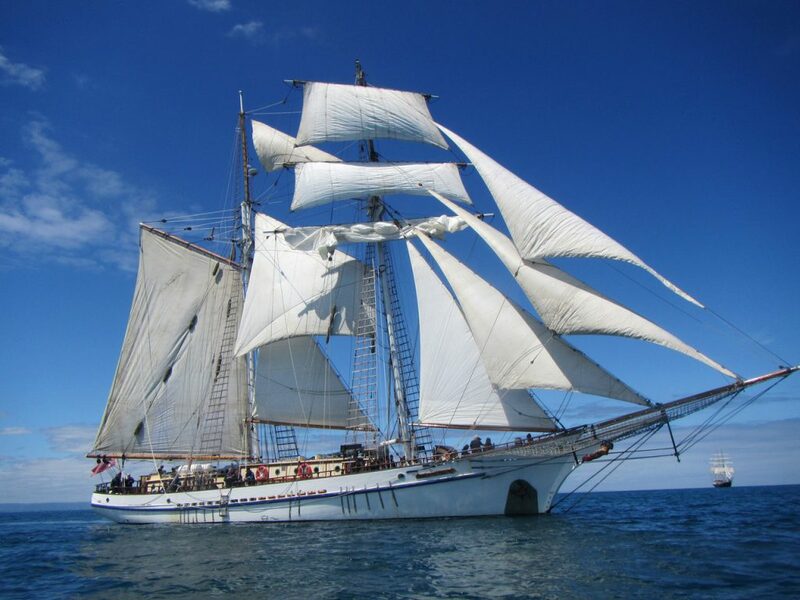 Tenacious is a remarkable and unique wooden sailing ship built to accommodate people with disabilities – including wheelchair users and the visually or hearing impaired – sailing alongside able-bodied crew. It’s a remarkable program that offers otherwise inaccessible experiences. Whilst on board and I was also able to think about the driving forces that allow this amazing mode of transportation to take place. So what’s really going on? First, we need to move! 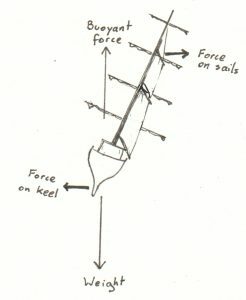 To create forward motion using just the materials of the ship, and the wind, air and water, requires a perfect balance of forces. When the wind is pushing from behind the ship, it’s quite straightforward: the huge ‘square’ sails (named for their position ‘square’ across the deck, not their squarish shape), can be set open to the wind; the wind exerts a force on the large sail area, which exerts an equal and opposite force on the wind (as per Newton’s Third Law of Motion) and if these forces are great enough to overcome friction and the resistance of the water, the sails – and therefore the ship with them – move in the direction of the wind. A large, thin keel underneath the ship stabilises this movement, essentially so our ship doesn’t bounce around from side to side as it moves through the water. To turn, the ship’s wheel shifts the rudder, which changes the flow of water underneath the ship; to slow down, sail area is reduced by hoisting some of the sails out of the wind and bunching them up, called furling. But what about when the wind is coming from where you want to go, not behind you? This is when the science gets a little more interesting! The square sails are all but useless – designed to catch the reliable Trade Winds from continent to continent, these sails were often set on a steady course without needing to be altered for weeks, even months, at a time. 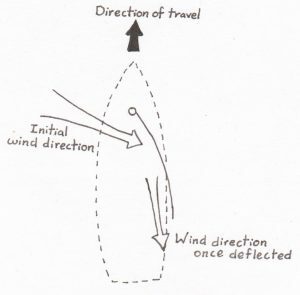 They are limited to 60° off the wind – that is, useable only at 60° either side of the direction the wind is coming from. That’s really not very useful if you want to sail upwind. There are other sails, however: often gaff sails (far left in the image below), plus smaller, triangular sails that run ‘fore-and-aft’ (from the front to the back) rather than across the ship. Notice that in this example the wind is coming from closer to the fore of the ship, not from behind it. If acting alone, we can see the force F would be pulling the ship to the side, as well as slightly forward. Remember the keel? It’s very long, very flat and very thin. It runs all along the bottom of the ship, submerged in a dense, viscous liquid called seawater. 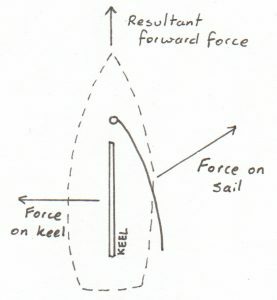 The resistance created when wind tries to drag this large, flat area sideways through water is huge – so huge that overall (if we are using vector subtraction, we can say the remaining component is not canceled out) the force takes the ship in the direction of least resistance, which is forwards. In this way, a sailing boat or ship with fore-and-aft sails can sail as close as 45° off the wind. To get somewhere directly upwind, all it has to do is continually change direction (called tacking, wearing or gybing), keeping as close to the wind as it can. There are a couple of other forces at play, too. 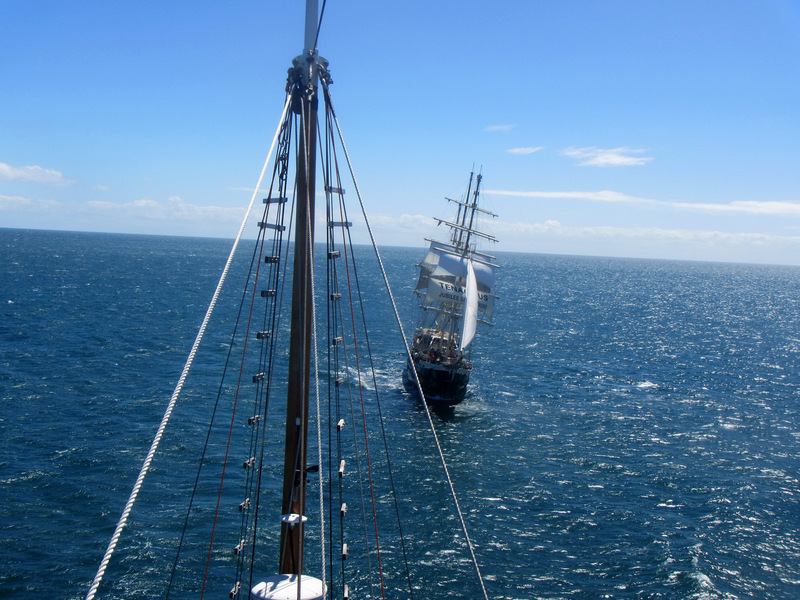 As per Newton’s First Law of Motion, these only act on our ship if they don’t quite balance (or cancel) each other out, but we do have some very beautifully balanced forces at play when sailing! In strong winds a sailing vessel will heel, or tilt sideways; this is balanced with the intentionally weighted keel (these days most yachts and sailing vessels are ‘self-righting’, weighted in such a way that if they capsize, they will turn in the water and bring themselves upright again due to the weight distribution). Similarly, the buoyancy of the ship and its weight cancel each other out. 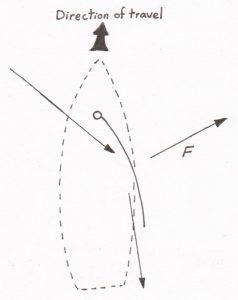 Not only that, but rotational force, known as torque, results from both of these. The torque is also neatly balanced out – the clockwise torque trying to spin the ship one way is balanced by counterclockwise torque trying to spin it the other. There you have it – just a taste of some wonderful ways in which physics has been taking people around the world for centuries, and allowing us to explore, enjoy and appreciate the wonders of science! What have you noticed happening around you? What examples can you find in your life of physics at play?